Why Whey Protein Is Among The Most Valuable Kind Of Protein! Whey protein is among the most valuable kinds of protein available. It scores very well in all measures of protein value, such as PER (Protein Efficiency Ratio) 3.2, BV (Biological Value) 100 and PDCAAS (Protein Digestibility Corrected Amino Acid Score) 1.0. The PDCAAS is the most relevant measure of the quality of proteins for humans and is the official rating system used by the World Health Organization. The score of 1.0 is the highest possible rating. Whey protein contains all of the essential amino acids in biologically significant amounts and is simply one of the most complete sources of proteins and amino acids. The whey protein concentrate and isolate used in Vivace Protein is produced through an ion-exchanged, ultra filtration process that yields the highest level of protein and amino acids while preserving all the naturally occurring, immune enhancing and muscle nourishing bioactives. It does not contain any synthetic hormones such as rBGH. 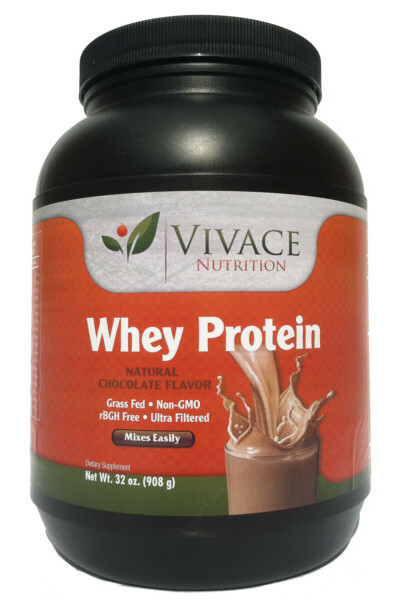 3 Reasons To Include Whey Protein In Your DietWelcome to the New Vivace Nutrition Website! These statements have not been evaluated by the Food and Drug Administration. This product is not intended to diagnose, treat, cure, or prevent any disease. This product is not intended for those with a medical condition. Use only as directed. Consult your physician before beginning any prescription drug. Consult your pediatrician before giving this product to children under 18 years of age. Free shipping is to the United States only.